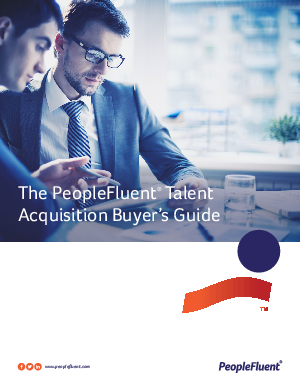 The PeopleFluent Talent Acquisition Buyer’s Guide is your manual as you navigate the recruiting technology landscape in search of a perfect solution for your organization. It focuses on questions to ask in preparation for new recruiting technology and illustrates how to fluidly transition into the phases of purchase and implementation. This guide can be used as either as a step-by-step workbook as you explore recruiting technology or as a reference tool you can use to assess your organization’s current place in the recruiting technology spectrum and the next logical steps you need to take. As your organization purchases recruiting software, keep in mind that you may start each purchase at a different phase in the process. This guide will enable you to jump in at any point and move through each phase with ease. When acquiring a new solution, the goal is not to change the way you recruit, it is to enhance your current recruiting process and results.